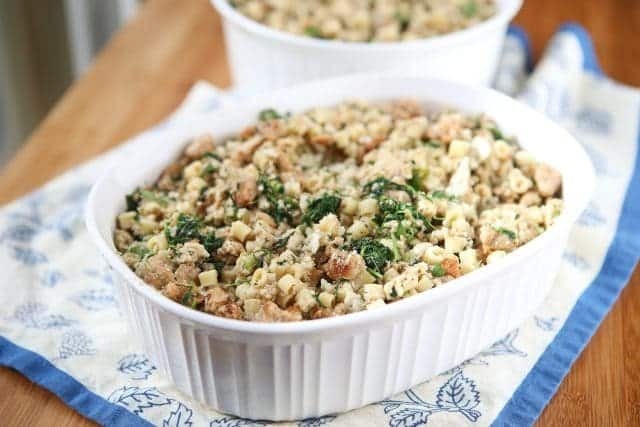 My family’s Italian Stuffing made with sausage, pasta and spinach … a recipe my grandmother made for our family for as long as I can remember – it’s my favorite part of Thanksgiving! 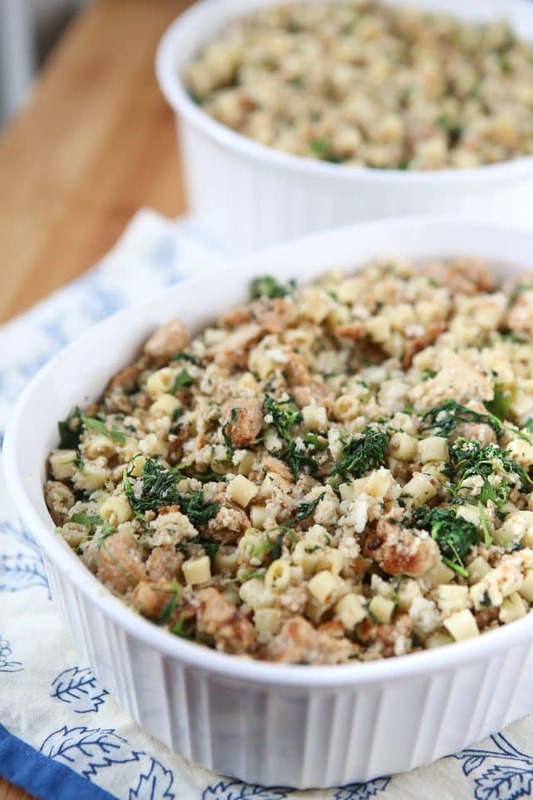 Click here to pin this Italian Stuffing recipe! I’m reposting this special Thanksgiving recipe today in honor of my grandmother who we lost in August of this year. If you’ve been reading my blog a long time you know her and my grandfather were a big part of my life and now they are both together in Heaven smiling down on us. This was the stuffing she always made for us and we look forward to it every Thanksgiving. I seriously can’t even believe we are just a few weeks away from Thanksgiving already. I also can’t believe I’m posting a recipe for Thanksgiving before Thanksgiving. 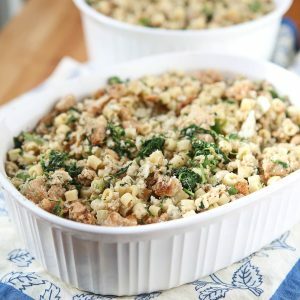 I’ve never really been good about keeping up with holidays ahead of time here on the blog, but this recipe for my family’s Italian Thanksgiving Stuffing has been around for quite a few years and last year I finally remembered to take photos of it so I can share it again with you in time for the holidays this year. Obviously, this is not your typical holiday stuffing, but this is the only stuffing I know. With my family being from Sicily, Thanksgiving wasn’t really a big holiday for us when I was young. We celebrated it, yes, but I wouldn’t say it was as traditional of a holiday as most other families I knew. We had the turkey, but up until probably high school, we would eat manicotti or a big plate of ziti before the turkey even hit the table. I never knew what green bean casserole was until I was in college. Sweet potato casserole? I think I first had sweet potato casserole (or candied yams) the year I was engaged to my husband. This stuffing is not very traditional, but I love it and look forward to it every year. My kids do too and that honestly always warms my heart. Tradition makes me truly happy. My Nonna made the stuffing for as long as I can remember, but over the years my mom, sister and I have taken on most of the cooking for the big holidays, you know how it goes. I kind of took over making this recipe for our Thanksgiving a few years ago and have made it my own, as close to the original “recipe” as possible (my family doesn’t really have exact recipes). To round out the turkey and stuffing some of the recipes I love to make for my family every year are Apple-Orange Cranberry Sauce, Roasted Green Beans with Shallots and Almonds, and these Whipped Sweet Potatoes with Pecan Topping (they like marshmallows on top too). So now you know one of my family’s oldest Thanksgiving recipes, let me know about yours. Leave a comment below! Cook 1 lb Ditalini pasta as directed. When cooked, drain and set aside to cool. While pasta is cooking, crumble and brown Italian pork, chicken or turkey sausage in large saute pan. Season with salt and pepper. Combine pasta and sausage in a large mixing bowl. Add chopped spinach to bowl and stir to combine. Add herbed stuffing and continue to stir. Taste and season with salt and pepper, then add beaten eggs to mixture and mix well. Pour stuffing mixture into lightly greased baking dishes (I usually use corningware). Pour chicken stock evenly over stuffing. Cover the casseroles and place into 350 degree oven for about 30 – 35 minutes until cooked through and starting to brown. At this point, take cover off casseroles and let cook for another 5-10 minutes so top gets golden brown and crunchy. Follow Aggie’s Kitchen’s Thanksgiving board on Pinterest. I’ve never had stuffing with pasta before.My grandmother cooked more northern Italy so her stuffing was the kind with Luganega(a type of Italian sausage). I will have to try it. We would have antipasto and either lasagna or tortellini first. By the time turkey came no one was hungry. And I never had a sweet potato casserole either.We will miss you. Have a nice week and a happy Thanksgiving! Lisa… I too have never seen a stuffing w/pasta and that looks sooooo good!! Thanksgiving was pretty much the same w/the Italian goodies and the turkey and all it’s fix’ins came last and ….. who could eat another bite!!! So after many pleas, we convinced Mom to cut out the pasta dishes… eventually we had a very normal TG w/all the fix’ins. Have a wonderful Thanksgiving Day!!! Yum. I love this stuffing. I’ve never had stuffing with pasta but it looks and sounds amazing. Have a great trip and Happy Thanksgiving. Your stuffing looks so rich and savory. 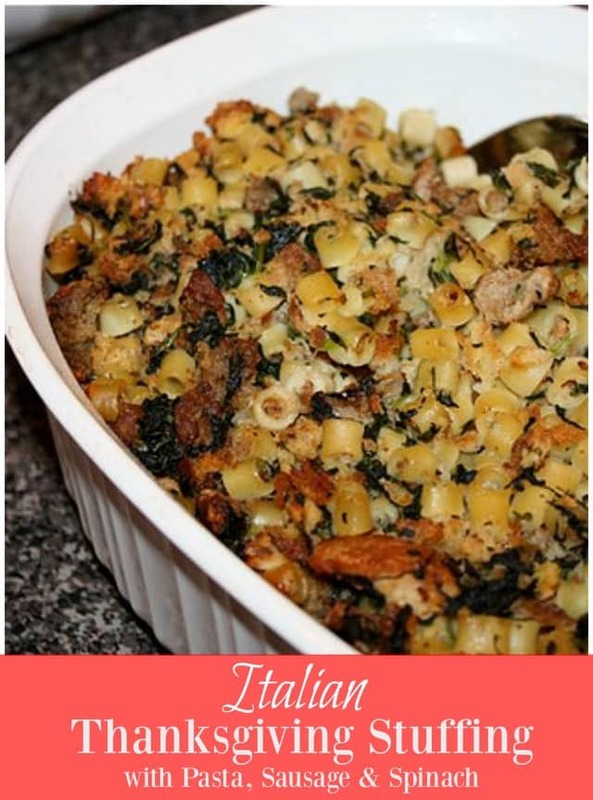 I would love to try this since I haven’t had stuffing with pasta in it before. Hope you have a wonderful time in the Smokies – stay warm! Wow, this looks amazing! I have starred this and can’t wait to try it! 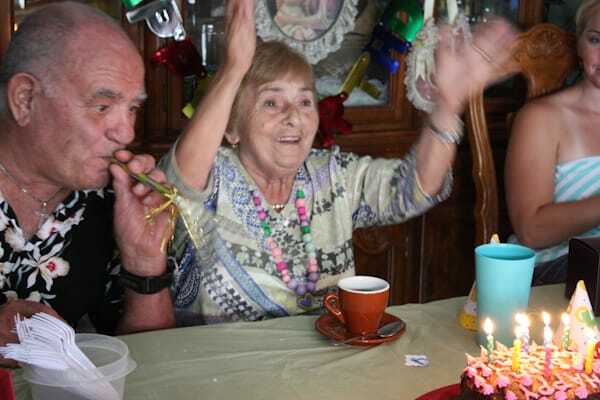 Oh Aggie, I’m sure you’ll make Nonna proud! This looks so delicious; I’ve never seen a stuffing like this. I’d love to eat this anytime, not just on Thanksgiving. YUM! Hope you have a wonderful trip! Wow, your stuffing looks so much better than the regular stuff! Have a Happy Thanksgiving!! Thank you all so so much for all the kind comments! I love hearing about all the other Italians that got stuffed on pasta before turkey! Stuffing is one of my favorite dishes at Thanksgiving. Aparantly lots of people think like I do. I put a poll on my blog and stuffing is winning as a favorite. Love this recipe Aggie, thanks for sharing. the stuffing looks incredible! thank you so much for posting the recipe! have a wonderful time in tennessee! hope you have a great vacation, i’m sure it was fun! OOh pasta in stuffing? Looks delicious! I love stuffing, it’s my favorite part of Thanksgiving dinner! Have a great trip and Happy Thanksgiving! Aggie, I never seen stuffing like this before. We used to have pasta before the turkey too. Have a great Thanksgiving! My husband’s family is Italian and they make a VERY similar stuffing every year. I had never had it before I met him, and now I love it. Have a great Thanksgiving!! Beautiful Stuffing Aggie! Enjoy your Thanksgiving weekend! Stuffing with pasta?! Hpw cool is that?! Hope you have a safe trip! I have never seen stuffing with pasta…SO Italian, i LOVE it, can’t believe i have never thought about this. Pingback: Thanksgiving Day roundup! Link-up! 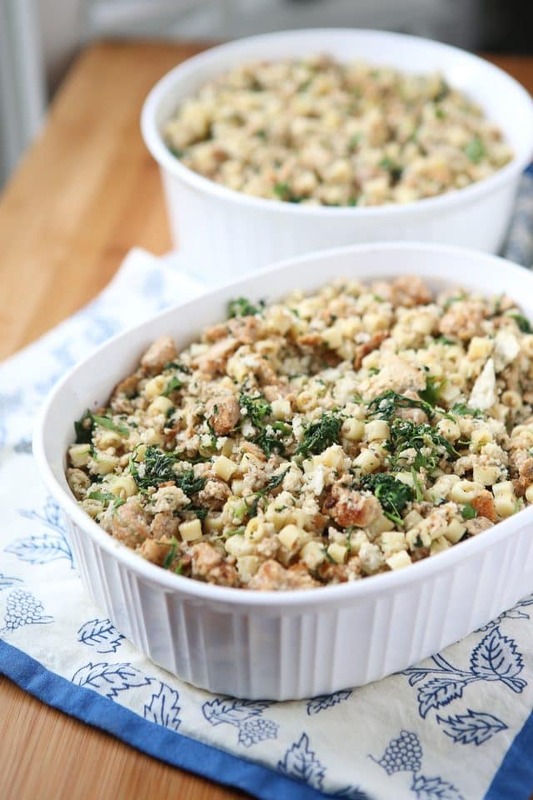 LOOKS SIMILAR TO OUR CHOPPED PORK AND RICE ITALIAN TURKEY STUFFING. ANYONE OUT THERE HAVE THAT RECIPE? I love this, Aggie! It looks delicious! It is so interesting how we all have our different traditions for Thanksgiving – even down to the dressing or stuffing we serve – according to where we grew up. I loved reading the history of this for your family. I’d love to try this sometime because it looks amazing! I’m making this tomorrow and can’t wait. Aggie, I remember the year you made it for our family!! It was so delicious! Happy Turkey Day Aggie. My girlfriend and I will BOTH love this recipe! I’m excited to give this a try, thank you! great enjoyable stuffing for thanksgiving when you are sitting on a table with your family. looks delicious!